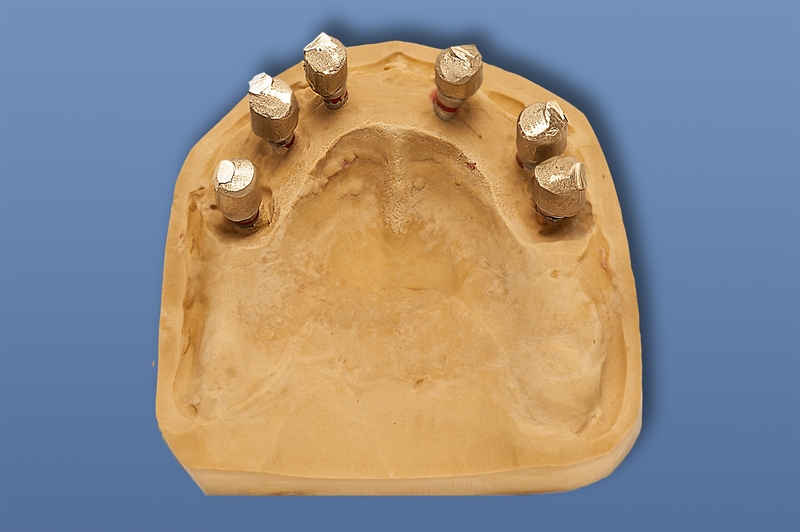 After preparation of the gum mask, measurements could be taken from the master model with laboratory implants. 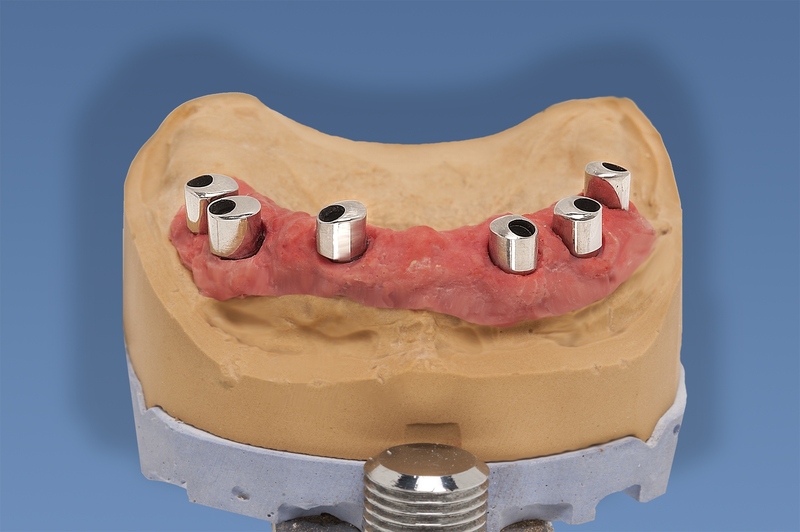 The RN® Burn-out copings were attached to the screwed-in bases and adjusted to length as necessary in the Articulator. The primary parts were milled on RN Burn-out copings in wax and cast in non-precious alloy . The secondary parts were sandblasted and carefully attached to a Straumann RN Variobase®. The units were then screwed into the master model, milled and polished. 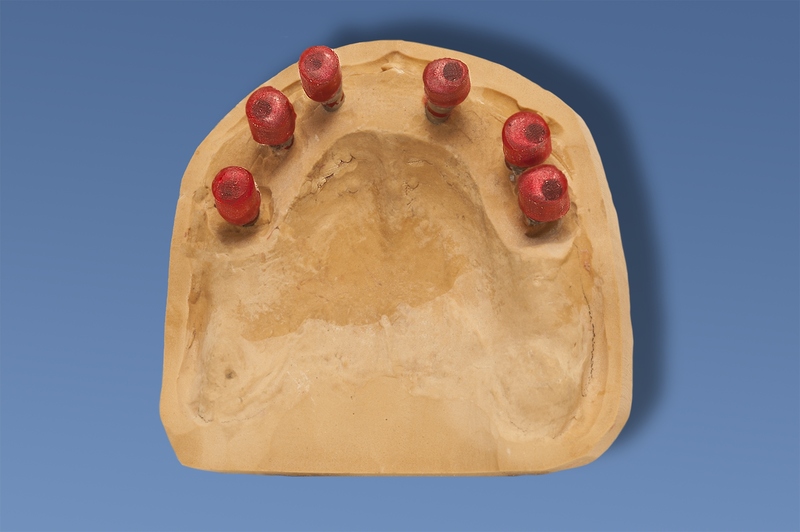 Fitting of the primary parts with a pick-up impression is not necessary at this stage, so modelling of the secondary crowns could be started straight after milling. In order to avoid confusion over the Abutments, a base was made from light curing acrylic to act as a positioning reference.milling of the plastic caps significantly reduced the time spent on metalwork. If you look closely (under a microscope) at the friction surfaces in conventional telescopic work after a certain period time, you nearly always see narrow striations and traces of wear on both primary and secondary crowns. With Galvano crowns, this can quickly lead to a loss of adhesion (as it is not really a friction with Galvano crowns), which cannot be restored. Signs of wear in the primary parts are completely prevented owing to the hardness of the non-precious alloy (NEM). Primary parts in non-precious alloy (NEM) can be made much thinner than when using precious alloy. (The fact that the primary parts are coloured silver instead of gold should be discussed with the patient beforehand). The consistent, highly polished finish of primary parts made from NEM, prevents „scratching of the inner surfaces of the secondary parts. Here the primary part works rather like a non-abrasive polisher, as seen in the broad, glossy friction surfaces. Production of the secondary parts is less expensive. 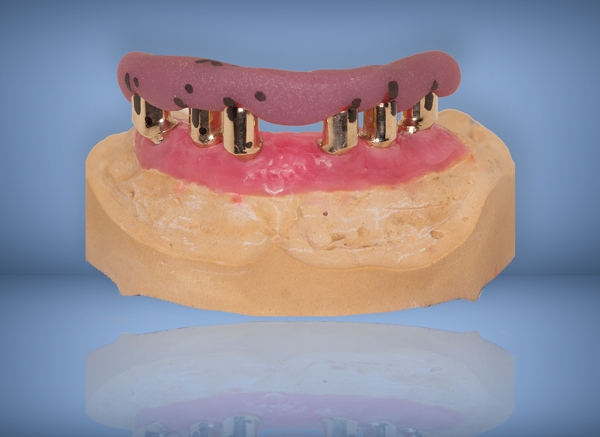 Longer lasting friction when compared to Galvano crowns. 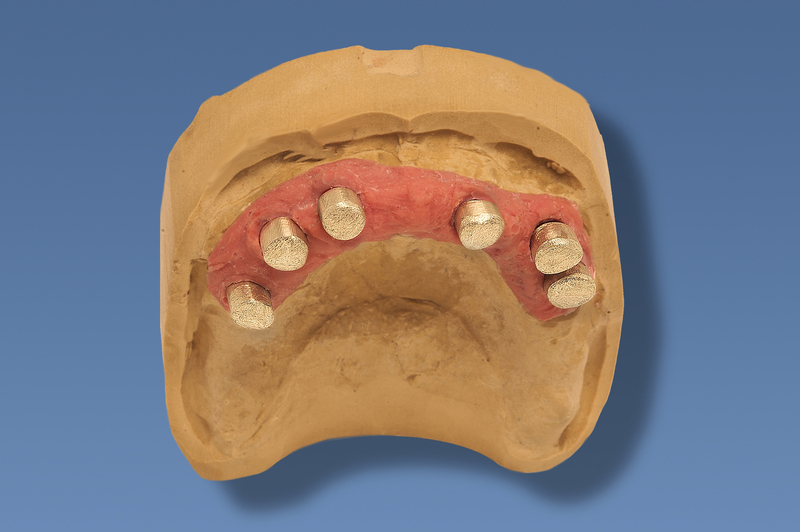 Secondary parts can be re-worked and re-milled safely, as they are substantially more stable than Galvano crowns. The components were subsequently fixed to the primary parts and milled again. The final milling creates parallel external surfaces, important for the production of the metal frame. Using parallel guides also meant there was no danger of unexpectedly perforating the secondary parts. The coarse milling cutter used at this stage gave the desired amount of abrasion whilst also creating an ideal adhesive surface. For fitting, a 1.5mm Erkolen®- foil was thermoformed over the complete work for positioning. Following small corrections, the try-in was secured using a matrix.